The reconstruction of the Connersville football program has been a trying process for head coach Adam Kelly, Sr., in his six years at the helm. It seems like it has been one step forward and two steps back for the Spartans in their quest for success. Thing may be on the verge of turning around, Kelly, Sr. and his troops have some building blocks that may lead to a second winning season this decade. “We are returning four of our five linebackers. Three of those four will be three-year starters. Our offensive line should be improved from a season ago along with the quarterback and the receiver positions. Our biggest strength will be in our ability to come together as a team and work towards obtaining our goals.” an enthusiastic Kelly, Sr. states. 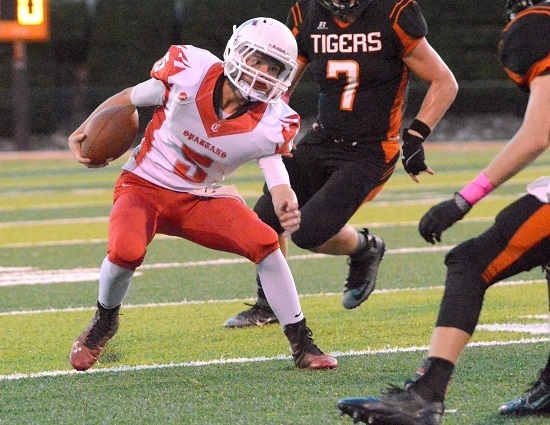 With seven starters back on each side of the ball, Connersville isn’t going to be in awe of anyone. The Spartans showed some toughness last fall as they came from behind in the second half of all four of their victories. The skill positions players will be young and lacking experience but are loaded with that “P” word – potential. Their performance will have huge impact on how well this team fares. If ever there was a year for Connersville to make a move, 2018 would be it. The schedule sets up nicely for the Spartans to gain confidence as the first six games are very winnable. Then the gauntlet of East Central, Lawrenceburg and Batesville to close out the slate. Every affair in month of October will have an intense postseason vibe around them. How the youngsters react during that stretch is going to tell us much about the future of Connersville football. Shane McClain, Sr, MLB – Our defensive captain and leading tackler the past two seasons. Another player that has played well but will have to take another step forward for our defense to be competitive in the EIAC. McClain had 101 total tackles and a sack on his way to Honorable Mention Class 4A All-EIAC accolades in ’17. Brendon Robinson, Sr, OL/DL – Took big steps forward last season in terms of ability and determination. He is another offensive player we believe will take another step forward and be an impact player for us, possibly on both sides of the ball. Was named Honorable Mention Class 4A All-EIAC as a junior. Adam Kelly, Jr., So, QB – A smart player with good size and improving physical tools. We are looking for Adam to take a big step up in his sophomore season. Kelly, Jr. threw for 298 yards and four touchdowns in his varsity debut. Shane Smith, Sr, OL – Has good size and great feet. Injury impacted his junior season. We are looking forward to seeing him at full capacity. Brayden Shaffer, Sr, OLB – Brayden returns for his third year as a starter. Pound-for-pound probably our best football player when he wants to be. We are hoping he steps up this season and reaches potential. He is a next level player. Jacen Beckman, Sr, MLB – Jacen returns for his third year as a starter. He has great speed and is very physical at the linebacker spot. For our defense to take a step forward, Jacen will have to bring his A-game every Friday. Jayden Murray, Jr, MLB – Excellent linebacker with a very good feel for his position. Puts himself in the correct spot and makes plays. We are confident he will take another step forward in his second year as a starter. Dallas Langley, Jr, TE – We expect Dallas to be a big part of both the run and passing game. At 6-foot-2 and 210 pounds with good speed he will provide our quarterback a good target in our play action game. He should get plenty of opportunities to score once we get in the red zone. Alec Adkins, Jr, slot/CB – Alec performed very well as a sophomore. We believe he will be an impact player and a leader for us this season in our defensive backfield. Landon Cerqua, Jr, FB – Landon is a football player! A 5-foot-10, 220 pound, hammer! He had success as a freshman and stepped away from football as a sophomore. He is going to carry a lot of the load this season and should be really fun to watch. Grant Davidson, Sr, slot/CB – We are really excited to get this athlete on the field. He is unproven on the football field but has accomplished a lot in his other athletic ventures so we expect him to be a contributor this season. Evan Shaffer, So, OLB – Is 6-foot-4 and 180 pounds with excellent feet and hands. Evan saw limited varsity action as a freshman but showed he is capable of playing with the big boys. He will be a fantastic possession receiver and does an outstanding job blocking out on the edge. Carter James, Jr, OL/DL – Will compete for a starting spot along the offensive line. He is one of the hardest working young men in our program. Carter has very quick feet and his strength is improving. Alex Edwards, Jr, OL – Will compete for a starting spot along the offensive line. Missed all of the ‘17 season with an injury but is healthy and ready to get his opportunity to make a difference. Griffin Crowe, Sr, OL/DL – Griff is a fantastic athlete that has accomplished a lot in other sports such as baseball and basketball. He will be new to the football team but is expected to make an immediate impact. Gabe Morris, Jr, slot/DB – Gabe is expected to be a major contributor on one side of the ball if not both. He has good speed and good instincts. Will make our team better wherever he ends up. (5-33 all-time) – Twenty times in the last 24 years Connersville has bowed out of the playoffs in Week 10. Coach Kelly, Sr.’s 20 combined wins in six seasons is one fewer than the program was able to produce in the 15 years before he was hired. Connersville has lost its last four games in each of the last five seasons. Ten times in the last 12 campaigns the Spartans have dropped at least four games in a row to close out the year. 2018 Team SnapshotAdam KellyClass 4A Sectional 22Connersville SpartansEIAC 4AfeaturedJr.